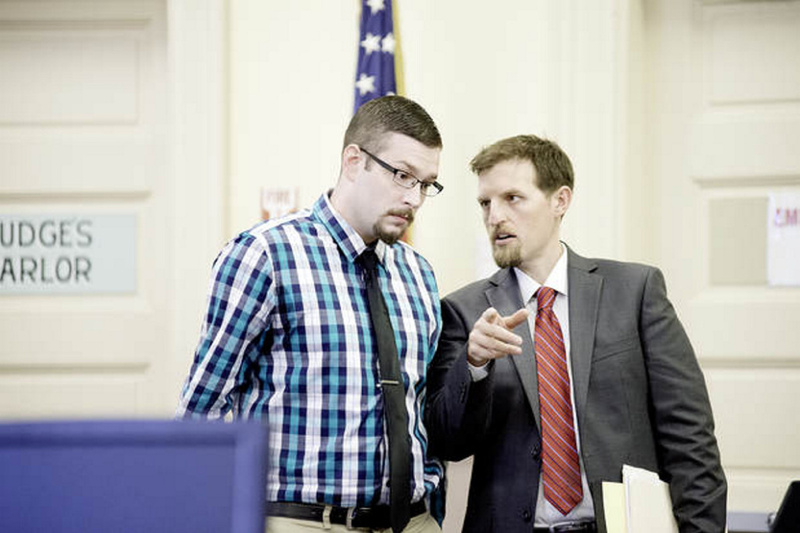 Timothy Danforth, accused of murder in the shotgun slaying of Michael Reis of New Sharon, did not take the stand in his own defense Thursday as the defense rested, calling no witnesses. FARMINGTON — Murder defendant Timothy Danforth chose not to take the stand Thursday on the fourth day of his trial. Danforth, 25, of Farmington, formerly of Wilton, is accused of shooting Michael Reis, 24, of New Sharon three times with a shotgun June 1, 2016, when payment for a bag of marijuana and a barrage of text messages escalated into a deadly confrontation at the home of Danforth’s father, Robert Danforth, at 259 Weld Road in Wilton. After the state rested its case Thursday against Danforth, defense attorney Sarah Glynn asked Justice William Stokes for a Rule 29 judgment of acquittal, a motion based on the evidence being insufficient to sustain a conviction, according to Maine law. Stokes denied the request, saying it was a question for the jury of whether the state had met the burden of proving Danforth had intentionally or unknowingly caused the death of Michael Reis. The defense rested and called no witnesses. Assistant Attorney General Robert “Bud” Ellis, prosecuting for the state, and Danforth’s co-counsels, Glynn and Jeffrey Wilson, were expected to give their closing arguments Friday morning before the case goes to the jury. During her testimony Thursday, Detective Jennifer King, of the Maine State Police Major Crimes Unit, identified several items and photographs from the scene as evidence. A 12-gauge Savage model 320-pump shotgun was found in a bedroom and two handguns were on a bed in the room. Photos showed two bats, a baton and a box of shotgun shells in the living area; Twisted Tea and beer cans in the kitchen; and expelled shells and red stains on the porch. Also admitted as evidence were photographs of the space where Kayla Gordon’s Subaru was believed to have been parked on Weld Road; a wrench with blood on it found at the end of the driveway; golf clubs, one in the front seat, one in back; a bat in the hatchback area; and more wrenches and Twisted Tea cans inside the vehicle. King said the red wrench with blood was in Gordon’s car and was pulled out to get Reis into the vehicle, according to what Zachary Uhlman told her. Uhlman was given a bag of marijuana by Robert Danforth and problems arose when he failed to pay for it. The defense attorneys questioned placement of the items in the Subaru and whether they were tested before being returned to Gordon. Four people rode in the back seat from a party on Main Street to the golf course and Robert Danforth’s nearby home, so someone would have known the golf club was there, Glynn said. “There was access to something that could be used as a weapon from every seat of the car,” she said. There were also questions about the car being left unattended at the hospital parking lot for about five hours, the items inventoried and then given back to Gordon. She also questioned whether a person, asleep in the front seat, who got out and walked home, was investigated and his home searched. Kimberly James, a firearms examiner from the Maine State Police Crimes Unit, described testing the shotgun and the distance between the muzzle and Reis’ wounds according to powder residue and a lead type of soot. Wounds to Reis’ foot and thigh were not made from within 2 feet of the muzzle, she said. The wound to the shoulder was within 12 to 24 inches. The first wounds probably occurred as Reis came toward the Danforths on the porch and the last hit to the shoulder as he was going down, she said. According to King, witness Matthew Kerr, during an initial interview, said Robert Danforth was at the top of the steps and Timothy in front of the door to the trailer. During a second interview in August, Kerr said Robert was by the door and Timothy was by a gas grill on the porch. The state also called Christine Waterhouse, a forensic DNA analyst with the Maine State Police Crime Lab, to the stand. Waterhouse described connecting blood stains on the porch to Reis by a DNA profile. She said she also identified the blood on the wrench as mostly Reis’ with a little DNA from someone else. There was not enough to make an identification. He went on to ask her whether she had tested other items from the car, such as Twisted Tea cans, a marijuana pipe, gloves, the bat and golf clubs. She said no such tests were requested. There was no reason to fingerprint or do DNA tests on the golf clubs and wrenches, King said during her testimony. The state asked how Reis’ DNA could have been on the wrench. Waterhouse said there were multiple ways, including his blood being on the hands of someone who touched the wrench. The defense played 911 calls made by both Robert and Timothy Danforth that night. Robert Danforth made two calls to a Wilton police officer earlier in the evening. During his testimony, Chief Medical Examiner Mark Flomenbaum said toxicology tests indicated Reis had a 0.095 percent blood-alcohol content.